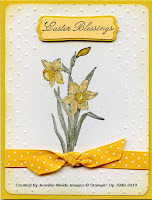 The second card from club used the Abundant Hope from the Occasions Mini Catalog. It is similar to another I did with this set for a swap, but I wanted a more authentic looking daffodil for this one so I chose Crushed Curry & So Saffron with Mellow Moss for the colors. Card base is Crushed Curry. The background layer is Naturals White that was put through the Big Shot with the new Pretty Polka Dots folder with the wooden craft frame so that the center is dot embossed. Perfect for this set!!! The image was stamped with Black Stazon ink-that is the best choice for coloring. We used markers to color: Crushed Curry inside the daffodil, So Saffron on the petals, Mellow Moss for the stem/leaves. So Saffron was sponged around the edge & the corners rounded. Crushed Curry ribbon was tied around the bottom. The saying was stamped in Black on So Saffron, punched with the Modern Label punch and layered onto the larger Modern Label cut with the Movers & Shapers die for the Big Shot. This could be used for any occasion-just change out the saying on the top. Get this set NOW-it's only guaranteed to be available through April. Hope you've all had a good Monday. Not very productive here but that's pretty typical. Card 3 will be posted sometime this week! It's a little more involved and will require some extra effort. Thanks all! !